Those of you that have read my reviews of Vukovar’s previous releases will know that I am somewhat of a fan of what they do. ‘Monument’ sees their first collaboration with iconic English artist, musician and composer Michael Cashmore (there’s some information at the end of the review if you want to know more about Michael Cashmore). What intrigued me about this collaboration is whether what I’ve come to recognise as Vukovar’s signature sound wasn’t recognisable or was. And more importantly, was it still disturbing and scary. This being really important to my appreciation of Vukovar’s music (or should that be compositions?). Look I like music that leaves me too scared to go to bed, in case my night is plagued by vivid dark, disturbing nightmares, that’s just me. What isn’t obvious from any of the information is whether Vukovar and Michael Cashmore collaborated on all or just some of the tracks. Listening there are things which seem to be more of a Vukovar thing, and some which bear a slightly different sound. I may be wrong. 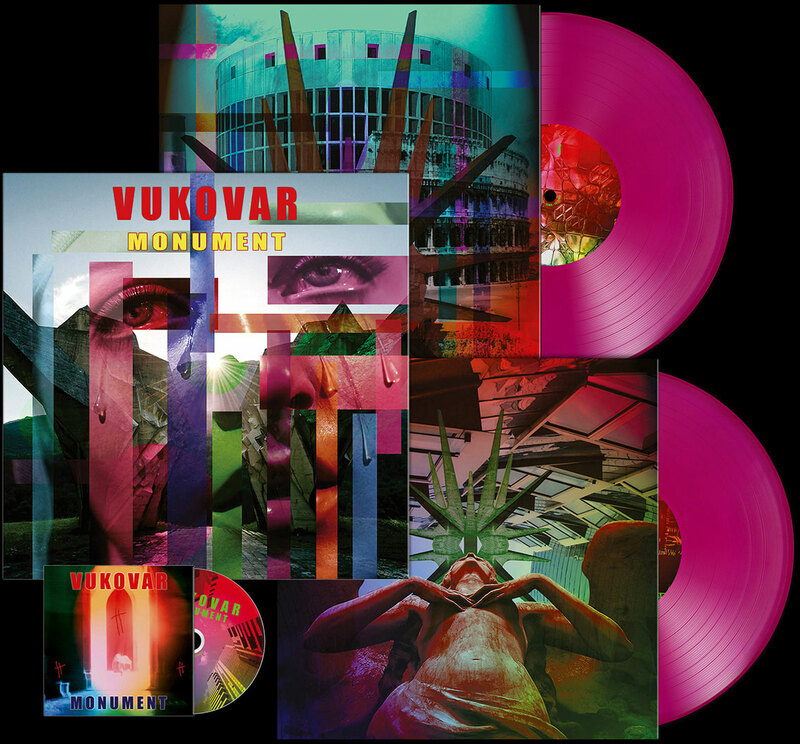 Some of you – who may have read my reviews or listened to Vukovar’s previous releases – may be asking ‘is there a theme or even some sort of concept to this album?’. And the answer to that is that the album reflects the concept of a Wonderland gone sour.. The tracks appear to convey what we might call a sense of bleakness and emptiness, and even deep dark despair. The album opens with a short spoken word piece called ‘This Brutal World’, this references Alice In Wonderland’, it’s a signpost of the direction this album goes in. ‘My Continuous Monument’ is a sound piece with spoken vocals (the vocals are covered in echo and other effects) and dark brooding synth sounds. But in there is this simple piano like sound that is just beautiful. With a backing vocal line that is just haunting. The whole is disturbing. It leaves you with a sense of dread. Or in my case a sense of joy, Vukovar never open up with the truly scary stuff, they work up to it, so dread is good. Up next is what we might refer to as a song ‘Little Gods’ is gothic post-punk. It has hints of Bauhaus, it even has hints of dirty period Depeche Mode. It has a tune people that is curiously earwormy and you can even hum it. I’m getting a little carried away here, it would be more accurate to say you can hum it in places. And you can dance to it. It is a rather glorious thing. And then we are back to sound pieces – there are three Visions In Silence I – Utrique Cosmi Et Sic in Infinitum, Visions In Silence II – Exist As I Exist and Visions In Silence III – The Concrete Fantasy. These gradually increase the dread, they become increasingly disturbing. The first is sound only. The second is sound, spoken words, random sounds of screaming and fear, if you weren’t dreading turning off all the lights before and going to a dark bedroom, you’re going to now. The third sounds as though it isn’t as disturbing, it’s actually a piece of music not purely a sound piece, but what I found was that given the state I was in after the second, even this sounds disturbing, it has this slight sense of off-kilter-ness, of something wrong. ‘Hover’ might be loosely defined as a song. The vocals are sang not spoken. Musically it’s sparse drum beats, synth sounds. But as the song progresses it becomes more a song, a song with a hauntingly beautiful melody in places. It is strangely weirdly almost folky (something that isn’t as much of a surprise as it may sound, Vukovar make music like this sometimes). And then it becomes something else with loud bell-like sounds, but this only lasts a short while and it goes back to being almost sweetly melodious. And then it does that loud thing again, and does that for the remaining part of the song’s 11 minutes. It leaves you feeling drained, it leaves you with a strange pressure in the top of your head, it leaves you feeling disturbed and shaken. I can’t even begin to describe ‘Their First Apocalypse’. It sounds like some sort of mutant horror film theme. It sounds vaguely Depeche Mode. It has these horribly disturbing weird sounds that run through it. ‘The Last Goodbye Happens Everyday’ sounds a little like early Human League, if you really need a ‘sounds like’. It is remarkably ‘straight’ for this album. It has a tune, it follows the verse/chorus structure. It’s a blast of lovely light relief. But it isn’t lightweight. And then the disturbing sound is back ‘The Duty Of Mothers’ is almost post-punk but it has this strange elastic sound, the drumming is all over the place, there are vocals overlaid all over each other. Weird toy like synth sounds. I’ve listened to this lots of times but it still doesn’t make any sense sonically, but even though I can’t make sense of it I love it. It has a sense of dark joy. A darkness that leaves you unable to shake it off. The first time I sat down and listened to this as a whole it left me somewhat confused and frankly overwhelmed. This isn’t because it’s a collaboration but because I just didn’t get it. The thing is that having listened to it again twice as a whole I started to get it, and then got it – Vukovar’s music isn’t easy, it demands attention and effort. It’s way more difficult than their previous albums. This may indeed reflect Cashmore’s involvement or just where Vukovar are right now. For me this is a Vukovar album I can dip into it, play what I feel like listening to and move on. Previous Vukovar albums demand that you sit down and listen to the whole thing. This doesn’t mean that you can’t sit down and listen to the whole of it, you can (and should). It’s just that the changes in feel sonically can be jarring (and indeed this may be exactly what the band had in mind, I wouldn’t put that past them). It is a bit of a rollercoaster journey. This of itself is disturbing. I know that there are already things from this album that I really like and others that are going that way, and that in time (more time than I have with an album I’m reviewing) I’ll grow to love it as much as I love the previous releases (which I liked on the first listen). But I’m somebody who already is a fan. For people who Vukovar are new to this actually might be a good way into the band. It has enough of the dark but it also has those songs that are just glorious and sometimes danceable (‘Little Gods’ and ‘The Duty Of Mothers’ deserve to played at some sort of appropriate club). Although when I say glorious I mean that sonically or musically not lyrically. Look I’m going to recommend this album, I’m going to say listen to it as a whole or just dip into the tracks that sound as though they might appeal to you from my review, and then listen to it all the way through. Do that, go back to their earlier albums and then work through them in order. This album will make more sense then I promise. Cashmore is revered by music lovers as one of Britain’s most influential and inspiring composers. In the mid 80’s Cashmore came into contact with David Tibet (ex-Psychic TV) of the group CURRENT 93, which he later joined in 1990. For the next 20 years Cashmore wrote almost exclusively all of the music for the group including the seminal albums ‘Of Ruine or some Blazing Starre’, ‘Sleep has His House’, ‘Soft Black Stars’ and ‘Thunder Perfect Mind’. Not only is he responsible for influential songs like ‘A Sadness Song’, ‘Whilst The Night Rejoices Profound And Still’ and ‘The Bloodbells Chime’ which are long considered classics in the progressive folk and industrial genre, he also has written music for British wave legend Marc Almond (Soft Cell) and avant garde sensation Anohni (Antony & The Johnsons). An artist renowned for his eclectic work and poignant nature of his music, Cashmore has also collaborated with the likes of Nick Cave, Bill Fay,Tony Visconti and many more. Vukovar formed in 2014 in a crumbling placefiller town in the North West of England and set about creating their own world within an otherworld. In their short yet eternal time, they have been relentlessly productive; ‘Monument’ being the 6th full LP after their highly well-received previous 5: ‘Emperor’, ‘Voyeurism‘, ‘Fornication’, ‘Puritan‘ and ‘Infinitum‘. They have had amongst their ranks Rose McDowall (Strawberry Switchblade/Psychic TV/Coil/Current 93), collaborated with and 80’s b-movie star Dawn Wildsmith, worked with world renowned hyper-realist Andrzej Klimowski, and actor, TV writer and man of all round good taste Graham Duff and others. is a high quality, super-audiophile disc – German pressing! Available from https://www.fantotal.de/de/nature-and-organisation/cd2x12-vinyl-vukovar-monument.html Amazon, HMV and all sorts of online retailers (you takes your choice and pays your money).